Max, Cat, Ant and Tiger are on a trip to the city zoo. When Ant's watch goes wrong, the children find they have a huge problem on their hands. Find out if they can get things back to normal in Escape of the Giant Chicken. 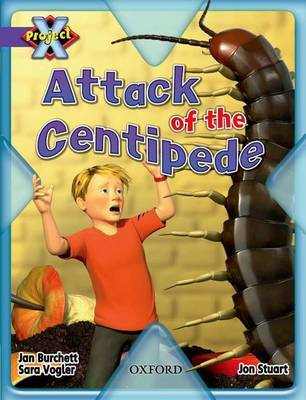 Then, in Attack of the Centipede, find out what happens later that day when Tiger shrinks to micro-size and goes inside a wormery. In the story The Monster of the Deep, the four friends decide to try to clean the rubbish out of the pond in the park, but will they escape from The Monster and save the fish? Travel back in time with Ant in the non-fiction book Dinosaur Safari and take a look at the world over 100 million years ago. Or read about what life is like today for some dangerous animals in Dangerous Creatures. Each book comes with notes for parents that highlight ambitious words or concepts in the books, prompt questions and suggest a range of follow-up activities. The Habitat Guided Reading Notes provide step-by-step guided reading support for each book in the Habitat cluster, together with guidance about comprehension, assessment for learning and vocabulary enrichment. Hands-on follow-up activities, plenty of writing opportunities and cross-curricular links are also provided for each book.